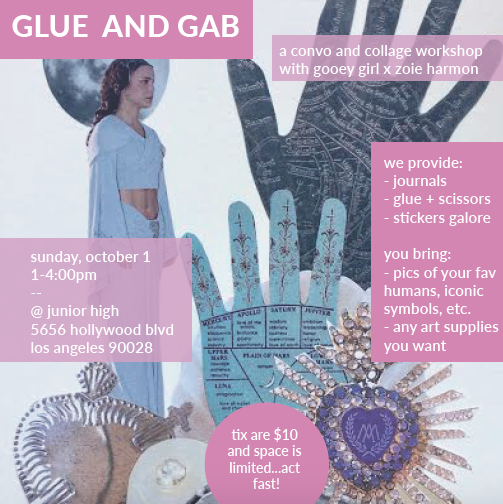 WORKSHOP / $10 / ALL AGES / Join Gooey Girl Founder Lenea Sims for a lively and low-key conversation and Q&A with artist Zoie Harmon about collage, journaling, reflection, and flow. Following the chat, you'll be provided with a journal, magazines, glue and stickers galore for 3+ hours of your own flow-filled collage creation. Bring friends, make new ones, have a snack, listen to tunes, and learn a new self-care practice to take with you beyond the afternoon. You'll also get to take the journal and the glue – lucky you. RSVP here.